In a job interview, how much should you reveal? Researchers at University College London say that depends on how good a candidate you are. The study showed that high quality job prospects who came off as too polished were deemed as inauthentic by interviewers. If they had scored high in self-verification, on the other hand, they presented themselves more honestly and were more likely to be hired. The reverse happened to lower quality candidates. Authenticity reduced their chances at getting the job. What are the lessons here? First, I guess you’d better know if you are highly qualified or not. If you are, feel free to be yourself. Secondly, if you are not highly qualified, why are you applying for the job anyway? And if you insist upon applying, you’ll do better if you put on an act. The researchers say that authentic behavior has been proven to lead to good outcomes over time in a job setting, but this study is the first to show that good outcomes also occur in short-term interpersonal interactions like an interview. From my own personal experience in the workforce, I question these findings. It has always seemed to me that it was the most inauthentic people who did well in both short- and long-term interactions. I’ve never found honesty to be highly valued in corporate America. Am I too cynical? What has been your experience? 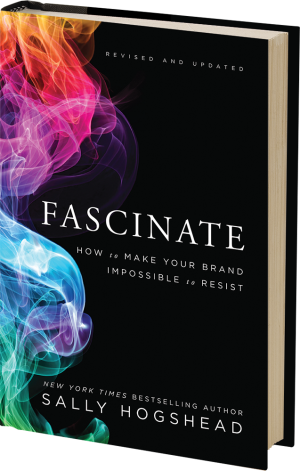 Sally Hogshead has just released a completely revised edition of her book Fascinate: How to Make Your Brand Impossible to Resist. With an extensive background in advertising, she brings a specific viewpoint to differentiating yourself from others. According to the system she has devised, your brand can be Innovation (using the language of creativity), Passion (the language of relationship), Power (the language of confidence), Prestige (the language of excellence), Trust (the language of stability), Mystique (the language of listening),or Alert (the language of details.) She’ll help you determine which one you or your company are and how to use your innate qualities to your best advantage. I found her original book, well, fascinating. This new and improved version promises even more help for those who want to stand out from the crowd. Ikea’s business model is as quirky as its furniture. The company believes that good design shouldn’t be reserved for the elite; instead, it markets good design for the masses. Each piece of furniture is a collaboration between the company and the consumer. In exchange for assembling the furniture yourself, you get better design at a lower price. Ikea calls this “democratic design.” A replicable process for ideas makes it possible to have “democratic branding.” Anyone can develop good ideas. I want to bring branding out of the ivory tower and into the trenches. Most businesses have limited time or money, but that doesn’t mean they can’t create effective and engaging messages. Just as you no longer need a travel agent to book your cruise, or a trip to the doctor to learn the symptoms of a common cold, you no longer need a marketer to do marketing. If it was easy to create a brand message, then anyone could do it. And if anyone could build a brand, then branding experts would be out of business.Here’s why: If a process is confusing and terribly difficult, only a few exquisitely talented minds do it. That’s why many agencies cultivate an intimidating image, hotbeds of new and exciting trends. Brand development usually requires months of research, development, and testing. The process is not for the faint of heart or the low of budget. Someone coached me that when presenting ideas to a client, it should be just one idea, so that it would be one of a kind. Like precious jewel sitting atop a black velvet cushion. By doing so, it would feel more rare and unreplicable. I believe that’s backward. Brands live inside communities, not corporations. Your brand lives inside conversations and aspirations. A brand lives in workplaces and schools. Inside homes and dinner table conversations. Brands aren’t static; they are living, breathing things that organically change and evolve as new people join the conversation. Your brand won’t shatter like your grandmother’s brittle china doll. Don’t keep your brand high on the shelf, out of reach. Hold your brand, push it, stretch it, and see how far it can go. A brand shouldn’t live under lock and key, hidden away at night. Quite the opposite. It should unite people, giving them a shared sense of ownership. Don’t just give consumers a better option to purchase . . . give them a better perspective on themselves and their world. If you’re a brand, it doesn’t matter how you see your consumers; it matters how your consumers see you. Corporations don’t create brands. People do. The people inside your company are also the keepers of your brand. An outside party won’t know the culture and spirit and nuances like your team. You might not have a dedicated marketing department, and that’s okay. But what if the branding process could be open source, accessible to anyone? It can be. It should be. You can do this. You can build your brand. You should build your brand. In fact, if you want to compete in a crowded and competitive marketplace, you must. Nobody knows your brand like you. You just need a template to follow. Or a hack. You’ve probably heard of “life hacks”— clever shortcuts that allow you to save time, money, or hassle. Life hacks might reveal how to sneak more green vegetables into your kids’ meals, or how to relax more quickly to fall asleep. A productivity hack might show you how to speed- read. And the author Tim Ferriss once described a “sport hack,” in which he supposedly hacked the national Chinese kickboxing championship by winning with only a few weeks of training. Josh Linker, venture capitalist and entrepreneur, describes hacking this way: “Putting motives aside, the act of hacking requires tremendous creativity. A hack is an innovative and unorthodox way to crack big problems.” So what about marketing? Can we “hack” that process? What if branding could be open source, accessible to anyone? It can be. It should be. You can do this. You can build your brand. You should build your brand. In fact, if you want to compete in a crowded and competitive marketplace, you must. And you don’t need an ad agency.